Located at the heart of downtown Toronto on Front Street between Bay and York, Union Station is the major inter-city transportation hub of the Greater Toronto and Hamilton Area (GTHA). The station sees over 200,000 travellers a day who are mostly commuters from all over the GTHA. 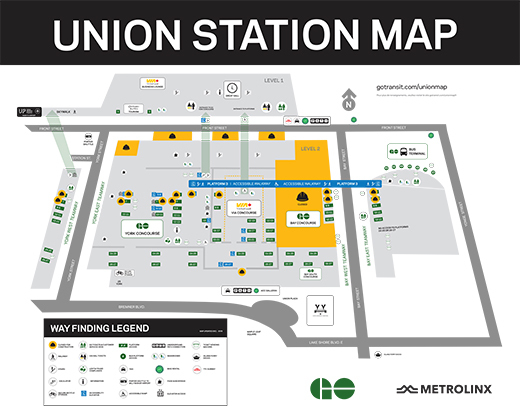 Union Station facilitates rail service from GO Transit, Via Rail, Amtrak, and Ontario Northland. 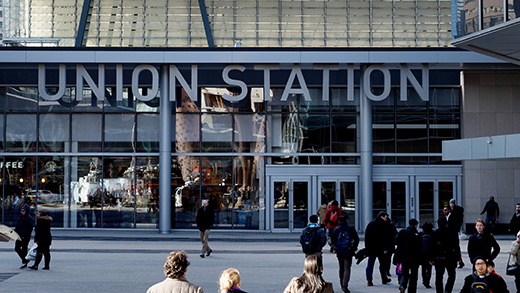 Combined with the TTC station and GO Bus Terminal, Union Station is the busiest passenger transportation facility in Canada. See more information about Union Station and connecting transit. 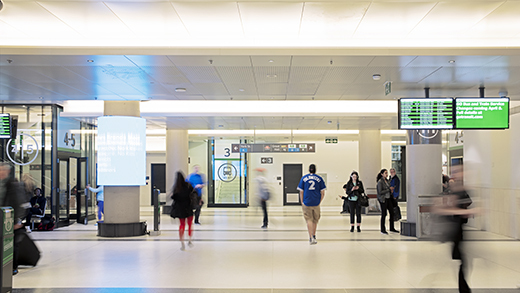 The modern, spacious 62,000-square-foot York Concourse, where passengers make their way to and from GO Train platforms, is the pulse of Union Station. Buy your tickets here or speak to one of our staff if you need help. You’ll find everything from PRESTO and Ticket Vending Machines to our Lost & Found, and easy connections to Toronto's PATH system. If you have some extra time, discover our vendors while you wait, including McCafe, Starbucks, Booster Juice, INA Market, The Bagel Stop, Uncle Tetsu's Japanese Cheesecake, and more. For info about all retailers in Union Station check out the City of Toronto’s website. 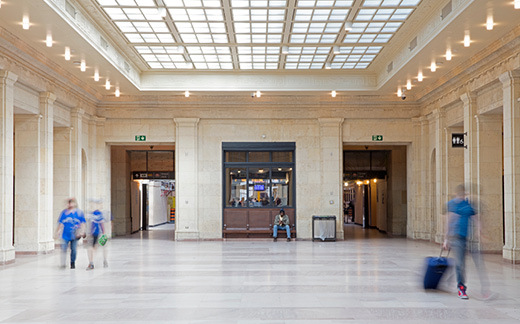 Union Station has a total gross floor area of approximately 706,426 sq. ft., servicing 41 km of track, and 6 km of station platforms. See our map below to help you navigate our vast network of tracks, concourses, and platforms. The City of Toronto and GO Transit are both undertaking an exciting revitalization of Union Station. The station building and train shed will be transformed into a modern interpretation of a historical landmark. Passengers can expect new staircases, additional elevators and escalators, and an overhaul of the look and feel of the station platforms and concourses. Preserving the historical elements of this almost century-old building is integral to the redesign. To learn more, please visit the GO Transit and City of Toronto Union Station Revitalization pages. Union Station is a big part of Toronto’s history. 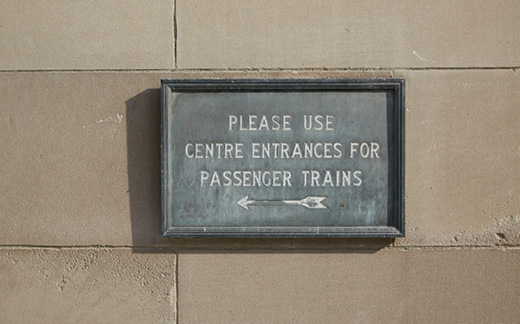 The current building opened its doors in 1927, although its history dates back to 1858 with the debut of the first of three stations. The Union Station we know today was designed in the École des Beaux-Arts style by a team of architects from the Montreal Firm of G.A. Ross and R.H. Macdonald, Hugh Jones of the CPR and John M. Lyle of Toronto. The Canadian Pacific Railway and Grand Trunk Railways commissioned its construction. 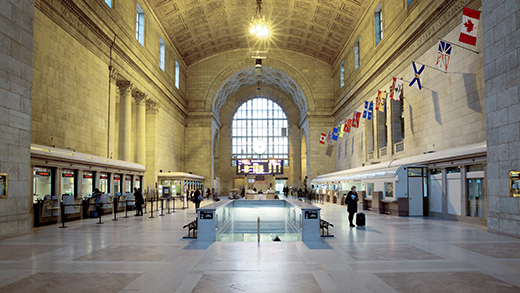 In over 150 years, Union Station has survived the Great Toronto Fire of 1904, hosted concerts, appeared as the backdrop in feature films, and most of all, served travellers near and far. Both the City of Toronto and GO Transit have been sharing ownership of Union Station since 2000. The City of Toronto owns the bulk of the station building, while the train shed, platforms, tracks, and newly renovated York Concourse are owned by GO Transit.